Not that long ago, the CRI Blog featured a post about the mobile game Angry Janitors, which is based on the importance of clean facilities. We at CRI were big fans of the game because of how much fun it was and because of the emphasis it put on carpet cleaning. Now, there is a game on another important issue: nylon recycling. 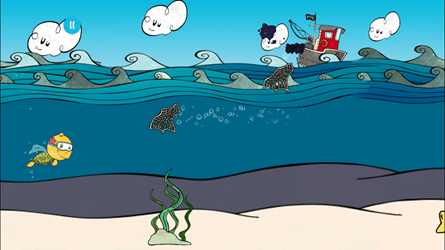 The game, Nylla, puts you in the role of the sea turtle Nylla who goes around the world recycling nylon in the form of fishing nets and carpet. The levels include: collecting fishing nets in the ocean and recycling carpet in corporate offices while avoiding obstacles such as desk chairs and dangerous sharks. The game is sponsored by EcoNyl, a brand from fiber manufacturer and CRI member Aquafil. It teaches the importance and value of recycling nylon. It’s an interesting game and quite a bit of fun once you get the hang of it. Aquafil, along with many other CRI members, has taken up the mantle of sustainability and is making huge strides in advancing carpet recycling along with making carpet a sustainable product. Nylla is a fun and creative example of how to educate consumers about the importance of carpet recycling. Sustainable practices are an important part of business today and CRI members have a long history of leading the way on environmental issues, including recycling. Members of CARE (Carpet America Recovery Effort), which include many CRI members, diverted more than 534 million pounds of carpet from landfills in 2013 and 3.25 billion pounds since 2002. In 2013, nylon represented 52% of the carpet collected by CARE partners, which translates into 278 million pounds of nylon carpet, a portion of which is recycled. Thanks to EcoNyl for educating consumers on the importance of nylon recycling and the rest of our members for making sustainability a major issue. Now if you’ll excuse me, I get back to saving the virtual ocean. Nylla is available for free through the App Store on iOS devices only.